Nick Offerman grew up in Minooka, Illinois. He received a Bachelor of Fine Arts from the University of Illinois at Urbana-Champaign in 1993. That year, he and a group of fellow students co-founded the Defiant Theatre, a Chicago-based theatre company. Offerman has appeared in films such as “November” (2004), “Cursed” (2005), “Miss Congeniality 2: Armed and Fabulous” (2005), “Sin City” (2005), and “The Men Who Stare at Goats” (2009). He has been married since 2003 to “Will & Grace” actress Megan Mullally. Offerman can be currently seen on the TV series “Parks and Recreation” on NBC as Ron Swanson, a meat-loving, wood-working, libertarian and director of the parks and recreation department of Pawnee. Prior to this, his most prominent role was as Randy McGee on “George Lopez.” He was one of the workers in the factory and the love interest of Benny Lopez. He has also appeared on shows like “Will & Grace,” “The King of Queens,” “Deadwood,” “Gilmore Girls” and “Monk.” Additionally, Offerman had roles in the 2012 films “21 Jump Street” as Captain Hardy and “Casa de Mi Padre” as DEA Agent Parker. Do you want to hire Nick Offerman? Directly request a quote. In 48 hours we can send you the availability of Nick Offerman If you would like to book Nick Offerman, Entertainment Booking Agency is the right place. 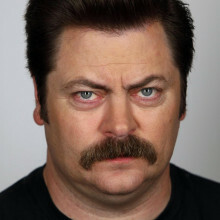 We will offer you the best price and contact the management or we directly contact Nick Offerman. For corporate appearances or speaking engagements you can contact our agents and the will help you true the process. Tags: hire Nick Offerman, Nick Offerman booking, book Nick Offerman, Nick Offerman appearances, find more information on booking Nick Offerman for appearances, Nick Offerman speaking engagements, Nick Offerman endorsements/spokesperson, Nick Offerman appearance fees, Nick Offerman booking agency contact info, biography of Nick Offerman, Contact an artist booking talent agent find a speakers bureau that can book Nick Offerman, speaker booking agency for Nick Offerman, Nick Offerman booking agency, Nick Offerman booking for corporate event. EBA is one of the biggest entertainment booking agencies in the World. We book hundreds of celebrities, artist, athletes and speakers in a year. Important to know is that we are not claiming to be the management of Nick Offerman. We are not the official agent for Nick Offerman. Companies from around the globe book these artists and speakers true our company be course we have one of the biggest networks and we always have direct contact with the artist or the management. We help you to find the right celebrities for your corporate of private events. Please contact one of our agents to get free advice and we will help to get the world-famous artist on your party.